This "Historically Speaking" column appeared in the Exeter News-Letter on Friday, April 12, 2013. Lecturing to a crowd in Exeter’s Town Hall is a thrilling experience for the speaker. Since its dedication in 1856, the hall has hosted some eminent speakers and housed events ranging from roller skating to boxing matches. Standing at the podium, it is impossible to avoid the realization that Abraham Lincoln spoke here in 1860. 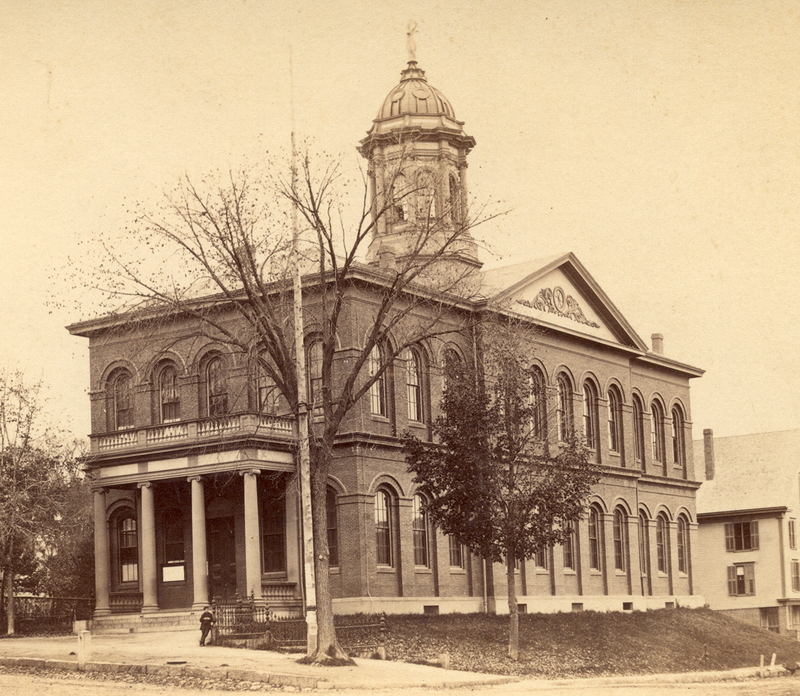 In 1853, Exeter had a town hall, then called a ‘town house’ on Court Street. Although it was only 12 years old, it had become apparent that the building, which had been hastily thrown together after a fire destroyed its predecessor in 1841, was shaky and could not accommodate all the townsmen when they met at the annual town meeting. Something had to be done to rectify the situation. Two factions quickly developed – as they do in most New England towns. On the one side were the fiscally cautious who felt that, with some repairs, the old meeting house would do perfectly fine. On the other side were the new businessmen of Exeter who wanted the town to gleam with modernity. They supported a grand new town hall that would be a place not only for meetings but offices, the county court, a library – big enough to have 1000 people meet there. Surely Exeter’s population would grow enough to require that much seating! The new town hall plan won the day and it was agreed to allow $12,000.00 to construct a wooden building in the center of town. The appointed building committee immediately changed this plan and hired architect Arthur Gilman to design an elegant brick building that was sure to impress anyone who came through Exeter. The new building would cost nearly $30,000.00. They borrowed some of this and Rockingham County kicked in $8,000.00 for the county offices and court. Work began in 1855 – the date we usually give for the building. By October, its walls were completed enough that the Exeter News-Letter noted, with a hopeful tone, “The Town Hall, in spite of all the croakings of ‘critic flies,’ grows ever more beautiful, and is a structure of which we may justly be proud. Cannot some forcing process make it ready for use this winter?” The building wasn’t ready for winter, but it was dedicated in 1856 just before the annual town meeting in March. For the next forty-five years, this was the only piece of public statuary in town. 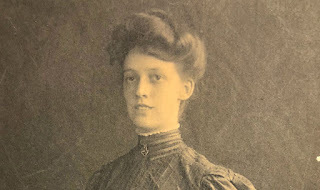 A young Daniel Chester French, who would one day go on to sculpt the great statue in the Lincoln Memorial, would have peered up at her from Exeter’s streets. Eight feet tall and weighing in at 500 pounds, Lady Justice presided over Front and Water Streets. Lincoln gave his speech at the Exeter Town Hall on Saturday, March 3rd, 1860. 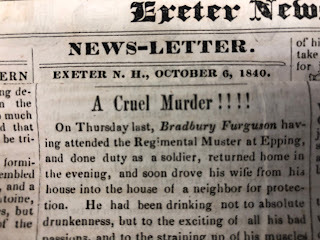 Visiting his son Robert, who was in Exeter at Phillips Exeter Academy, Lincoln had been asked by local Republicans to address crowds in Concord, Dover and Manchester. But it was Exeter that had drawn him north. Reminding the people of Exeter that slavery was an institution that should not spread to the western states; he held them spellbound in spite of his awkward appearance and high-pitched Midwestern twang. The crowd that night overflowed into the street. It was helpful to fill the building with people at that time, because until 1871 the Town Hall had no heat. Visitors complained that it was cold and drafty – especially at town meeting, which was traditionally held in March. That year, when steam radiators were installed, the gathered crowd instead complained that it was stuffy and overheated. It was also too small. Even though it had been envisioned as a place to hold 1000 people, the Town Hall never comfortably fit more than about 500 people. In 1911, a gallery was added creating 228 more seats. Lady Justice took a beating in a lightning storm in 1917 and was removed for repairs. Her arms were replaced and new lightning rods installed to protect her in the future. She wasn’t imperiled again until 1958, when thrifty townsfolk discussed decapitating the building by removing the entire cupola. It needed repairs and there was a movement in town to save taxpayers the $9000.00 estimated cost by simply lobbing the top off the building. Thankfully, the measure didn’t pass and the cupola was repaired instead. By 1991, the statue had seen better days. Made of pine, she was subjected to all manner of New England weather and in August, Hurricane Bob nearly tore her apart. She was removed again, reproduced exactly in stronger mahogany, and her doppelganger hoisted back in place 10 months later. Renovations were underway on the building when a small fire broke out in the roof on April 5, 2000. The fire was contained and knocked down in less than two hours. It’s a strange coincidence that the recent fire also occurred in April. Both fires brought damage, but happily nothing permanent. Our majestic Town Hall, although not used as often as it once was, will continue to stand in the center of town adding just that bit of elegance and history we require.